RING - SARAH COVENTRY. "CEYLON" FROM 1971. 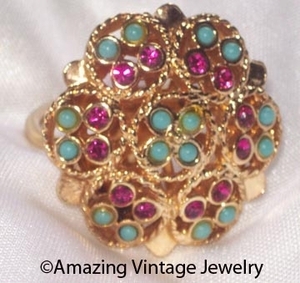 GOLDTONE WITH HOT PINK RHINESTONES AND TURQUOISE-COLORED BEADS - COLORS REMINISCENT OF THE ISLE OF CEYLON. RING TOP IS 1 1/8" IN DIAMETER. VERY GOOD CONDITION.